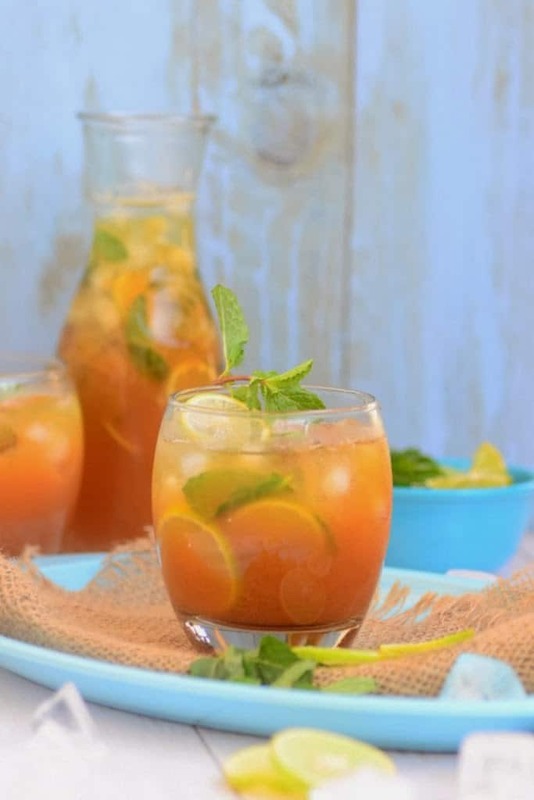 Passion Fruit Iced Tea is a refreshing drink which can be made in a jiffy. Here is how to make Passion Fruit Iced tea at home. The days are turning too warm in Bangalore. I have already started to draw the curtain of my living room during the day and water my plants twice a day. Gone are the days when I could savor all the warm and hearty soups that I love to sip on the cold winter evenings, it’s already time to move on to my iced teas and sherbets. On a recent visit to the grocery store, I found passion fruit in the fruits section and bought a few packets. I had a few recipes in mind but an Iced tea topped the list. So the passion fruit went into this very refreshing and light iced tea. 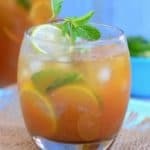 Now take a note of the recipe for refreshing Passion Fruit Iced Tea and in case you are unable to find passion fruit around your home then you may make Mango Mint Iced Tea as the king of fruits is back in the market! When it comes to a boil, add the tea leaves. Switch off the heat and let the tea steep for 2-3 minutes. Strain the tea and add sugar. Cut the passion fruits and remove the pulp. Press the pulp through a soup strainer to get the juice. You will get approximately 1 cup of juice. When the tea is cooled, add the passion fruit juice and lemon juice in it. Fill the serving glasses with ice cubes. Add a few mint leaves and lemon slices in each glass. Pour the tea in the glasses. Very refreshing and delicious passion fruit flavored Iced tea ! !